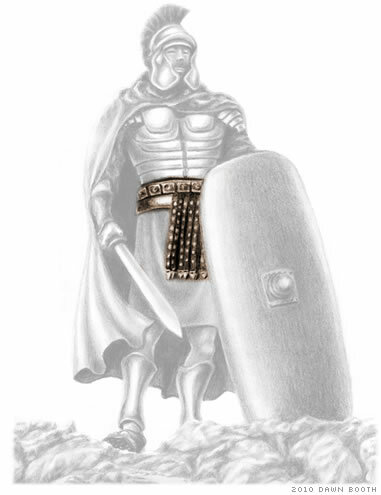 The second piece of armor Paul mentions in Ephesians 6:14 is "the breastplate of righteousness." Why is the breastplate important—for both ancient soldiers and us? A lesson from ancient Israel provides an ironic example of just how important armor can be. Perhaps you recall the cowardly and capricious life of King Ahab, but how did this evil king's life come to an end? This selfish leader who allowed a man to be killed just so he could have his vineyard (1 Kings 21)? This king of Israel "who did evil in the sight of the Lord more than all who were before him" (1 Kings 16:30, New Revised Standard Version)? God had prophesied that Ahab would die in the battle described in 1 Kings 22. So Ahab decided to disguise himself, while his ally King Jehoshaphat of Judah wore his own kingly robes. Their enemy had ordered his captains, "'Fight with no one small or great, but only with the king of Israel.' When the captains of the chariots saw Jehoshaphat, they said, 'It is surely the king of Israel.' So they turned to fight against him; and Jehoshaphat cried out. When the captains of the chariots saw that it was not the king of Israel, they turned back from pursuing him. "But a certain man drew his bow and unknowingly struck the king of Israel between the scale armor and the breastplate…at evening he died; the blood from the wound had flowed into the bottom of the chariot" (1 Kings 22:31-35, NRSV). Is it perhaps poetic justice that this unrighteous king lost his life due to an opening in his armor? Putting on Righteousness Facing the hordes of Satan, you brace yourself and pray. The hosts of your enemy share a collective, malicious grin, waiting for the command to do their worst. The battle cry sounds. They begin their charge; you tighten your grip on your sword and raise your shield. Weapons begin swinging with unrivaled fury; you do your best to parry the onslaught, but there are too many weapons to block. Eventually, you watch as one of your opponent's swords begins making a clean arc that continues right past your shield and toward your chest. You brace yourself, preparing for the worst and expecting your quick demise, watching the weapon move ever closer to you as time slows to a maddening crawl—waiting, waiting, when CLANG! The reverberating noise of the sword striking your breastplate pierces the air. Shaking your head in disbelief, you look down to find that the breastplate of righteousness stopped the deadly blow in its tracks. Delivered by righteousness and with renewed vigor, you plunge back into the fight. What purpose does a breastplate serve? The breastplate was a central part of the Roman soldier's armor—it provided protection for the torso, which contains vital organs like the heart, lungs and so on. Without a breastplate, a soldier would be asking for death, as any attack could instantly become fatal. With a sturdy breastplate, the very same attacks become ineffective and useless, as blows glance off the armor. Why is righteousness associated with protective armor like a breastplate? Without righteousness, we leave ourselves open to almost certain death. With righteousness—just as with a breastplate—the otherwise fatal attacks of our enemy are thwarted. To be righteous is to do what is right in God's eyes. God's commandments are righteousness. In contrast, lawlessness is sin, and sin is the opposite of righteousness. So to be righteous is to obey God's laws of love. What separates us from God, causing Him to withhold His protection? Behold, the Lord's hand is not shortened, that it cannot save; nor His ear heavy, that it cannot hear. But your iniquities have separated you from your God; and your sins have hidden His face from you, so that He will not hear. Iniquities and sins are actions and thoughts that go against God's laws. Since they are in conflict with God's way of living and are harmful to ourselves and others, our perfect and just God will not associate with us if we go down the path of sin and evil. We cut ourselves off from God and His protection! It is interesting to note that in this same chapter Isaiah mentions that God Himself puts on righteousness as a breastplate (Isaiah 59:17), which may be part of what inspired Paul to use this analogy. Whose righteousness should we be wearing? Righteousness may deliver from death, but whose righteousness are we talking about? The above scripture makes it clear that our individual level of righteousness is on par with "filthy rags"—and when you're looking to protect yourself from death, filthy rags make for a lousy breastplate. Also consider scriptures such as Job 36:3; Psalm 5:8; 23:3; 24:5; and 71:16, which show that true righteousness comes from God. It is God's righteousness, and not our own, which must serve as our breastplate and defense against Satan. What other characteristics does Paul compare with a breastplate? Faith and love also protect our hearts. It's interesting to study how faith and love relate to righteousness. Faith works "through love" (Galatians 5:6) and Abraham's faith (which was shown by his doing what God said to do) was "accounted to him for righteousness" (Romans 4:3; Genesis 26:5). As the Jamieson, Fausset and Brown commentary puts it: "'Faith,' as the motive within, and 'love,' exhibited in outward acts, constitute the perfection of righteousness" (note on 1 Thessalonians 5:8). How do I wear the breastplate of righteousness? So now we know what the breastplate of righteousness is. Paul gives us the command to "take up the whole armor of God"—the obvious question is, "How?" An in-depth concordance study of all the scriptures concerning righteousness (there are 301 in the New King James Version!) reveals that servants of God in the Bible who had righteousness all had it because they followed God's way. Though it may seem a sweeping statement, it is through a continuing and dedicated adherence to both the letter and spirit of God's law that we can defend ourselves with His righteousness. Once we have put on the breastplate of righteousness, we must be sure not to remove it. Ezekiel 33:13 shows that wearing righteousness is not a one-time event; rather, it requires a lifetime of action. One day, the war we're fighting will be over. And when it is, we are promised, "The work of righteousness will be peace, and the effect of righteousness, quietness and assurance forever" (Isaiah 32:17). By faithfully living God's way and staying clear of Satan's, we will find this peace, quietness and assurance—forever.